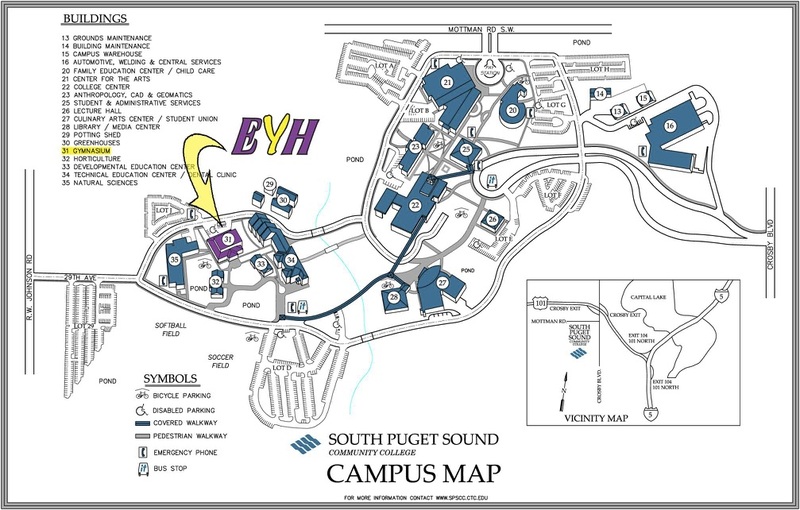 On the day of the conference, meet us in the Gym (Bldg #31) on South Puget Sound Community College's campus (directions below). Please arrive at 9:00 am to check in and receive your goody bag and session assignments. We will have a brief welcome ceremony, then you will go to your first of three sessions. Don't worry about getting lost - you have a campus map in your bag, and there are many volunteers who would love to point you in the right direction. You'll attend two 50-minute sessions then return to the Gym (#31) for a light lunch. After the third session, make sure you come back to the Gym (#31) for the exciting Mainstage conclusion. EYH encourages you to make clear arrangements with your parent/guardian regarding transportation plans. Please be picked up promptly at 2:10 p.m. Please make sure to have bring your student to the the Gym (Bldg #31) on South Puget Sound Community College's campus (directions below) at 9:ooam so that she can pick-up her schedule, t-shirt, and goody bag. Please also plan to return to the Gym promptly at 2:10pm. ​Please arrive at the Gym (Bldg #31) on the South Puget Sound Community College at 9:00 am to check in. We will have a brief welcome ceremony, followed by two presentation. Don't worry about getting lost there are many volunteers who would love to point you in the right direction. After your first two speakers you'll then return to the Gym (#31) for a light lunch. After the final speaker, make sure you come back to the Gym (#31) for the exciting Mainstage conclusion. On the day of the Conference, please arrive early enough to check in the Gym (Bldg #31) [see below for directions] and set up your supplies in the classroom. Typically this is between 8:00 am and 9:00 am. Volunteers arrive as early as 6:30 to begin set up. The girls arrive at 9:00 and you can expect them in your classroom by about 10:00. If you have a need on the morning of the conference, please call 360-489-7846. Depending on the job you have signed up for, your day could start as early as 8:00am. Whatever your arrival time, please go directly to the Gym (Bldg 31) and check in with the Volunteer Coordinator for your specific day-of-event instructions.